By Scott Gilfoid: Showing very little ambition, former heavyweight world title challenger Dereck “Del Boy” Chisora (27-8, 19 KOs) suffered a disappointing 12 round majority decision defeat against unbeaten EBU heavyweight champion Agit Kabayel (17-0, 12 KOs) on Saturday night at the Casino de Monte Carlo Salle Medcin, in Monte Carlo, Monaco. The judges scored it 115-113, 115-114 for Kabayel, and 114-114. Boxing News 24 scored it 115-113 for the 26-year-old Kabayel. Chisora lost his chance of winning the contest by getting off to a slow start in the first 6 rounds. Chisora was too patient, and he failed to press the attack on the quick-footed Kabayel. The fight was there to be one had Chisora not looked so lazy. Chisora fought like he was cocky that he was going to be able to wear down the inexperienced Kabayel. Chisora’s slow approach to the fight would have worked had Kabayel stood in front of him and traded for 12 rounds, but he didn’t do that. Kabayel used movement, quick combinations, and jabs to squeak by Chisora in many of the rounds. It was clear from round 1 that Kabayel was going to be a problem for Chisora. Right off the bat, Kabayel nailed Chisora with a fast 3-punch combination to the head that froze him momentarily. Chisora looked surprised at the speed of the Turkish fighter, as he seemed to be expecting a slower fighter. In rounds 2 and 3, Kabayel used nice jabs and fast 1-2 combinations to control the action. Chisora was plodding forward looking to land his wide hooks. Chisora was landing, but he wasn’t able to connect with more than one punch at a time in most of cases, because Kabayel would move away from him to keep from getting hit. Chisora fought well in round 4, appearing to get the better of Kabayel in a close round. It was still far from a dominating effort from Chisora, because he was getting hit by fast shots from Kabayel. Kabayel looked a little tired in this round, being that his movement was causing him to expend too much energy. Kabayel was moving well, but it was coming at a high price with him gassing a little bit. Chisora landed some good hooks to the body and head in this round. In round 5, Kabayel was effective in nailing Chisora with jabs, and keeping on the outside. Chisora walked into a hard right hand from Kabayel at the midpoint of the round. Chisora looked like he was going to take the round with some nice right hands. However, in the last seconds of the round, Kabayel came on with some hooks to take it. Round 6 was another close round with Kabayel doing just enough to win the round. Chisora landed some nice hooks and uppercuts, but Kabayel came on in the last part of the round to nail Del Boy with combinations. Kabayel got the better of Chisora in rounds 7 and 8 with his faster shots, and his ability to get out of the way of the return fire. 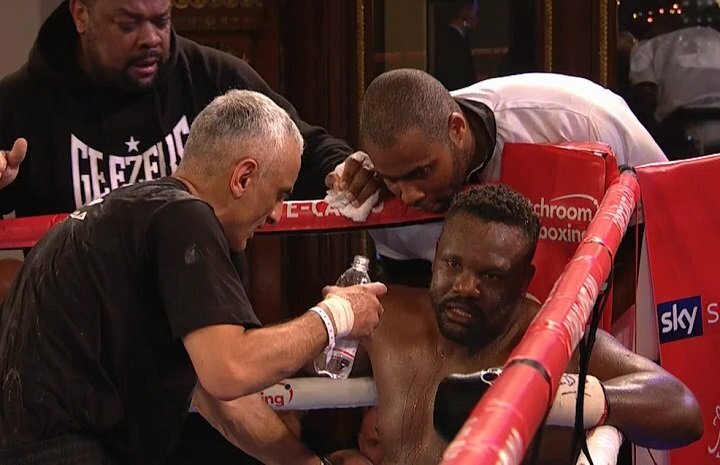 Chisora needed Kabayel to stand still so he could get his shots off, but he wanted nothing to do with that. Kabayel continued to move and avoid being a stationary target. By the 9th round, things were starting to look bleak for Chisora, as Kabayel was simply too good for him. Kabayel was too fast, too busy and too mobile for Chisora to deal with. If this was a younger heavyweight with a sense of urgency, then Kabayel would have been in trouble. But Chisora was moving at a snail’s pace, making it too easy for him. Chisora came back strong in rounds 10 and 11, showing a sense of urgency, as if he realized that he was letting the fight slip away from him. Chisora clearly won those rounds with some big hooks. The problem is that Chisora had given away so many earlier rounds; he needed to score a knockdown by this point in the fight so that he could catch-up. In round 12, Chisora landed some big punches on Kabayel. The two fighters traded in a toe-to-toe manner briefly with Chisora getting the better of the action. This was a close round for Chisora on my scorecard. The loss for Chisora really hurts his career. He came into the fight ranked #8 with the World Boxing Council. Chisora had talked of wanting to fight a rematch with Dillian Whyte, and get a title shot against WBC champion Deontay Wilder. The loss for Chisora, however, makes it difficult to justify him getting a rematch with Whyte for the time being. That doesn’t mean it won’t happen, but it just means it’s not likely to take place soon. Whyte has bigger fish to fry and trying to get a title shot against Wilder or a fight with Anthony Joshua Chisora is going to likely need to do a little rebuilding before he gets the Whyte rematch. As far as a title shot against Joshua or Wilder, I think that’s out of the question for Chisora right now. He’s going to need to put some wins under his belt, and try and beat one of the top heavyweights so he can make the boxing fans believe in him. What we learned from tonight’s fight is Chisora doesn’t have enough talent to beat good heavyweights unless he’s in top top shape and fighting as hard as he can. Chisora didn’t look in great shape, and he fought in too much of a lackadaisical manner, as if the win was in the bag.